Just wrote a long post and it deleted so my options were one of two things. 1. Throw my phone out the window. 2. Re write what I could remember and fight the urge to scream. I'm sticking with options 2 but I don't know how long this will last so here goes nothin. We are road trippin in the red mini van all the way to Arizona. 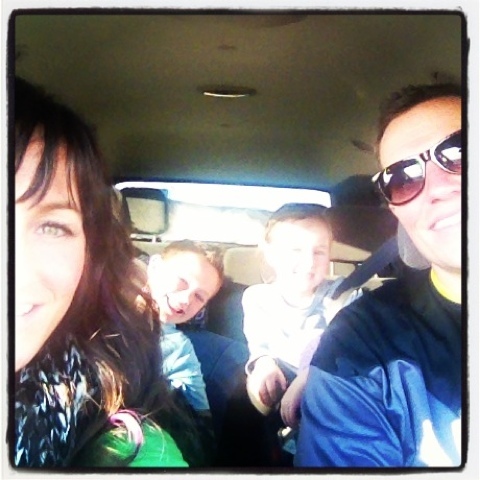 I'm loving being in the car with my three favorite people. I have been working so much and there's nothing better than being "trapped in a small space" together. We aren't the liveliest bunch at the moment. D and B are watching movies on the iPads and Bri and I are singing along to Glee songs. I really needed this family time. February is one of those survival months... We just gotta get through Feb. I had trainings in Iowa this past weekend followed by a trip to NYC for the Wendy Williams show. I got home last night then had a millions things to do before leaving this afternoon for the wedding. After the wedding is a work meeting in LA then the LA Zumba Instructor Conference. Then I'll be home a few days and then I have trainings in Indiana. Did I lose you there? Yes me too. Without this all written down I don't know where I'm headed next. I'm so grateful for my job and truly wouldn't do it unless I enjoyed it. It's not easy and work is work but to really love what you do I believe is a unique gift I have been given. NYC is one of those puzzling places. Every time I go there I am shocked at the busy hustle and bustle pace the city maintains. I feel lucky to have survived every time I'm heading back home. Taxi drivers I'm sure have a quest for speed and danger. They speed up, slam the breaks, thread the needle, honk, yell, all while I'm about to scream of fear in the back seat. I'm reminded of just how used to my Utah life I've become. I'm getting car sick so that's it for now but I do have an interesting story about my flight home ready for my next post. Glee songs; car sick; NYC; mom of two; so much in common. you are an amazing dancer & great singer & fun personality. Thank you for sharing bits of your life. Take care!!! !